Emojis are considered to be the first universal language of the internet generation. All people – no matter what age or origin – understand them. This is why nowadays Emojis are omnipresent. Since the early days of digital communication, emoticons where used as a way to express feelings. Research found that when we look at a smiling face online, the same parts of the brain are stimulated as when we look at a human face. 56% Instagram profiles use emojis. The profile group from 1 to 1.000 followers uses them significantly less than all other pages. But over the year 2016, the use of emojis in that group had the biggest growth by 37%. Another interesting fact is: The biggest Instagram pages analyzed used emojis in 81,6% of their posts. So the most popular and most frequently used emoji on Instagram is the camera icon. The study also proofed that posts with emojis earn a higher interaction rate on Instagram. Why this? Instagram posts containing emoticons seem to be perceived in a more positive way and thus stir more feelings from the recipient. Quintly found that the interaction rate – which makes profiles of different sizes comparable – showed an increase from 1,77 for posts without emojis to 2,11 with emojis. 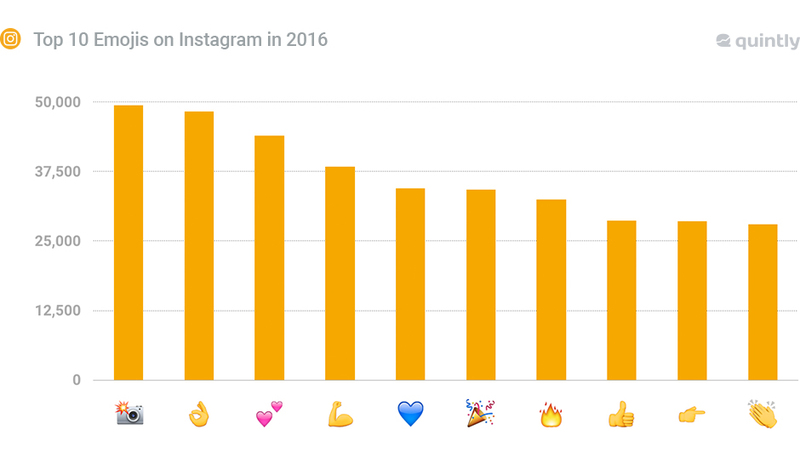 That is an increase of engagement of 17 % for Instagram posts using emoticons. Do you want to optimize your Social Media presence? Or develop and implement a holistic Social Media and Online Marketing strategy within your company? Then we at Simone Philipp Management are glad to help you. Just contact us!